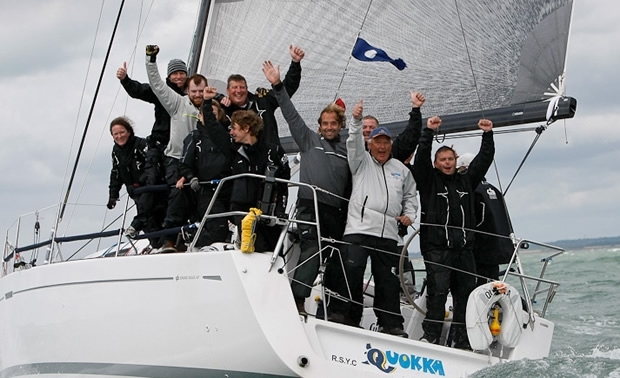 With eight bullets in eight races, Peter Rutter and the crew of the Grand Soleil 43 Quokka 8 comfortably secured the RORC's 2011 IRC National Championship title as well as victory within IRC 2. Keronimo teetered in her pitchpoled position for what seemed like 10 seconds, her bow buried so deeply into the water that the instrument displays on her mast were submerged, until eventually the fitting at the end of her bowsprit exploded and the chute roared aft destroying all the stanchions along her starboard side. “We lost one guy off each side and one off the bow,” continued Shaw. “So we scooped everyone back in, wrestled the chute down over the back, pulled the jib up, bore away and carried on with the race.” Thankfully no one was hurt in the incident. Victory in the hard fought IRC 1 was deservedly scooped up by the winner of both today’s two races, Piet Vroon’s Ker 46 Tonnerre de Breskens 3, also winner of the Jackdaw Trophy for coming second overall under IRC after Peter Rutter. Anthony O’Leary’s Rolex Commodores' Cup winning Ker 39 Antix finished just a point adrift to take second in IRC 1, ahead of third placed Keronimo. Another equally unusual incident occurred prior to the start of today’s first race on board Peter Morton’s MAT 1010, one of the contenders in IRC 3, when her port cabintop window imploded. The exact reasons for this remain a mystery, but Morton believes the window was weakened by a barber hauler block repeatedly rapping against it and broken terminally when the weight of one of the crew was applied to it. In the brisk conditions they were forced to retire before racing today. In IRC3 today’s winner, claiming both races, was Michael Brough’s Bavaria Match 38 Steady Barker, but even this fine show left them three points adrift of Mike Bridges’ Elan 37 Elaine, the class victor. Brough, who has been toughing it out since he twisted his knee during racing yesterday, says Steady Barker enjoys light or heavy airs and in this regatta they have seen more than their fair share of the latter. IRC 4 saw Adam Gosling’s Corby 30 Yes! 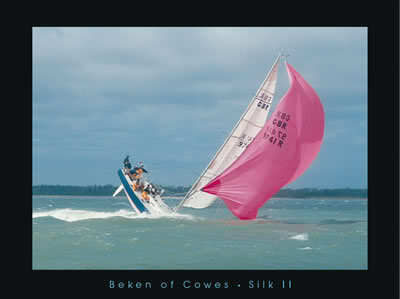 claim two bullets to win their class overall, albeit just three points ahead of Michael Kershaw’s Half Tonner, Chimp.